From finding the best print partner to choosing the right blanks, it can be overwhelming to start a T-shirt business. We teamed up with our friend Taryn Rasgon, of the brand Vegetaryn, to learn about all the ups and downs of starting her own successful T-shirt business. Check out the video below and keep reading to hear directly from her to learn more about all the important factors anyone should know about how to start a T-shirt business. I started Vegetaryn three years ago, because I wanted to create a vegan lifestyle brand. I put pun-ny and funny sayings on tees, tanks and sweatshirts. I believe even something as simple as a T-shirt business can make a difference. 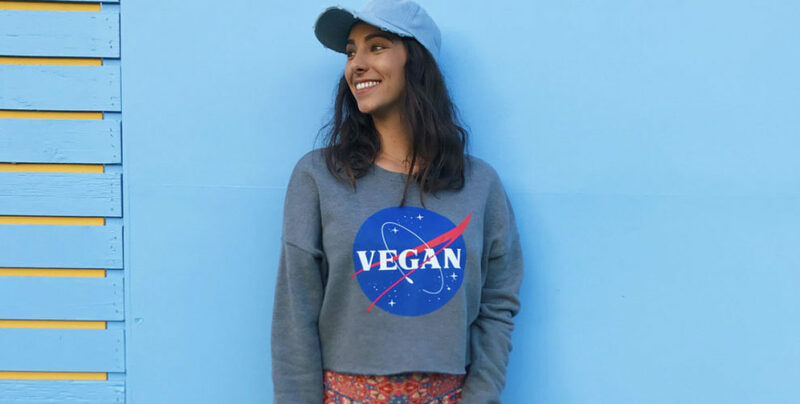 Now there are thousands of people who wear Vegetaryn, who are walking billboards for veganism! How do you come with your designs? When any idea for a shirt pops into my head, I immediately write it down, and keep a running list of ideas. What was it like when it was just you and then when did you hire on an in-house designer? After two and a half years of running Vegetaryn by myself, I finally decided it was time for help so I could scale my company. I now have an in-house graphic designer, an inventory manager and an events coordinator. What’s your guiding philosophy as you create tee concepts? My philosophy is to create T-shirts that spread the vegan message, I like to call it activism apparel. How did you discover BELLA+CANVAS? A friend of my used to work at BELLA+CANVAS and recommended I check them out. After doing some research, I felt like they were the perfect fit for my brand! How important is finding the right blanks to you? Finding the right blanks that are NOT made in sweatshops is super important to me. I wanted to work with a company that treats their employees fair. Also, finding shirts that were durable and super comfy was a must! I love the feel of BELLA+CANVAS tees – they are super soft!! For these reasons, I felt that BELLA+CANVAS aligned with my brand and was the perfect fit for me! What was your journey like finding a printer? Finding a printer can be tough. There are tons of screen printers out there, but I was able to find a female-owned company right here in downtown LA, Deluxe Screen Printing. It is crucial to find a print shop that you can closely work with to bring your designs to life. The ladies at Deluxe Screen Printing have been super helpful and supportive of my business. What are some tips for finding the right printer? When looking for the right printer it is important to do your research. I highly recommend meeting with them to make sure it’s a good fit. I also think it’s crucial to get a sample made and do a test run, so you know exactly what you’re going to get when you go into final production. What platform do you sell your products on? I sell my products on Shopify. It is an amazing platform for e-commerce sites. They make running a small business possible. There are tons of templates to chose from to build your site, awesome analytics, simple ways to communicate with your customers, and apps for any other needs you may have! What is your main traffic driver? My main traffic driver is Instagram. I post what I wear and eat everyday on my account! Check it out @vegetaryn. What are the main social media tips you have?